Every hunter has a preferred method for attracting deer. Some use calls, and some use scent or bait—or even a combination of both. For those of you looking for a solid attractant, we have compiled a list of 2017’s top contenders. In order for us to refer to a product as the best deer attractant or best deer bait, it must deliver proven results. There are of course many variables and skills you must possess to come home with the venison you desire—but these attractants are designed to give you the best shot. Deer Baits —What’s Your Strategy? There is a versatile range of deer attractants to choose from, so you need to develop a strategy. Many baits are designed for same day attraction and are designed to attract deer all-season-long. Some are even designed to be planted months in advance. Use the bait and attractants below to hunt, view, photograph, or enjoy the grace and beauty of your local species. You knew it was coming, a doe urine bait designed to attract bucks. This is a one-time use scent bomb, that you pop the top off—and toss a few yards in front of you. Just make sure you aren’t in the downwind when it goes off. 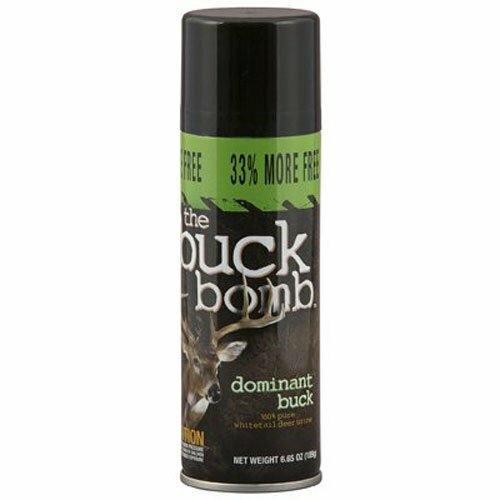 The bomb will coat nearby grass, stumps, and leaves, sending a downwind whiff to nearby bucks. Just make sure you know where downwind is, so that you can properly position yourself to the direction the bucks will be coming from. Be patient, as it can take an hour or so for them to find their way back to the source. And you guessed it, it might be one of the top attractants—but it doesn’t smell too good. We put this bait on our list because it creates an attractant site—not just a one-off draw. A supplement that releases a mineral-rich vapor trail to attract bucks. Keep these sealed tight, so that they won’t interact with moisture and start releasing their vapor before you are ready. Bucks require minerals, but bucks are territorial. When they find a mineral-rich source, they will rub and scrape to mark it as their own. Create a large enough area, and multiple deer will continue to frequent the area—providing you with a go-to hunting or viewing ground. How proactive are you when you hunt? 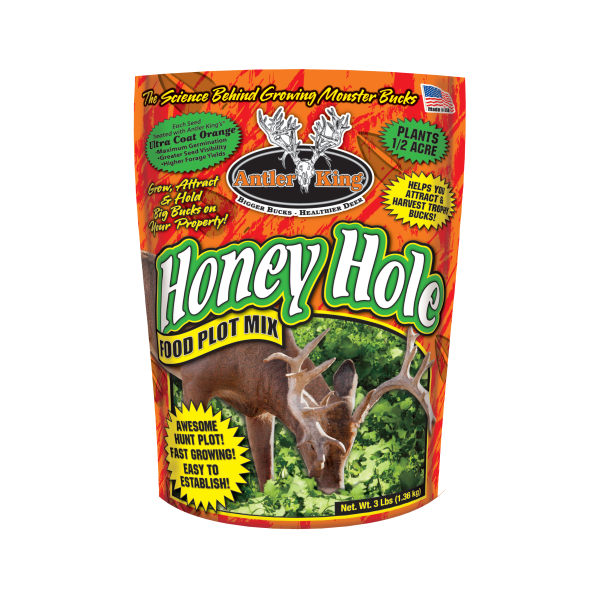 If you know where you are going to be hunting this fall and winter, then consider planting this honey hole mix after the first spring frost. This fast-growing blend of rapeseed and turnip seeds can be planted with the suggested amount of fertilizer, after simply scratching the surface to plant. Nature will take care of the rest. Come hunting season, you can have up to a 1,500 square foot patch deer come to feed. It’s not the best choice for last-minute, or out of state hunting—but perfect for your go-to local spots. If you are searching for an easy-breezy bait, this is one of your best options. 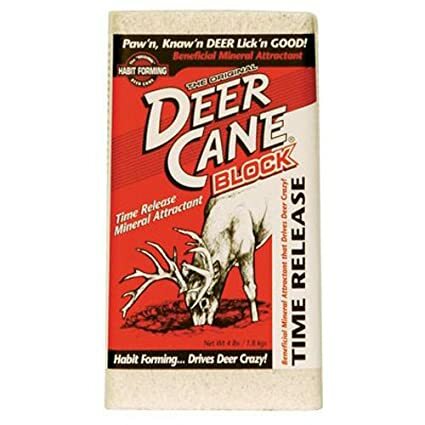 This 25-pound lick block can be positioned anywhere you like, and will attract deer with its nutrient rich compound. This block is made with molasses, corn, soybeans, and cottonseed meal—with natural apple flavoring. You can place on site a day or more prior to your hunt, or the day off and wait it out. This also an excellent method of attracting deer to your backyard—not for hunting, but for a close look at these beautiful creatures. You might see a theme in many of our recommendations—molasses. 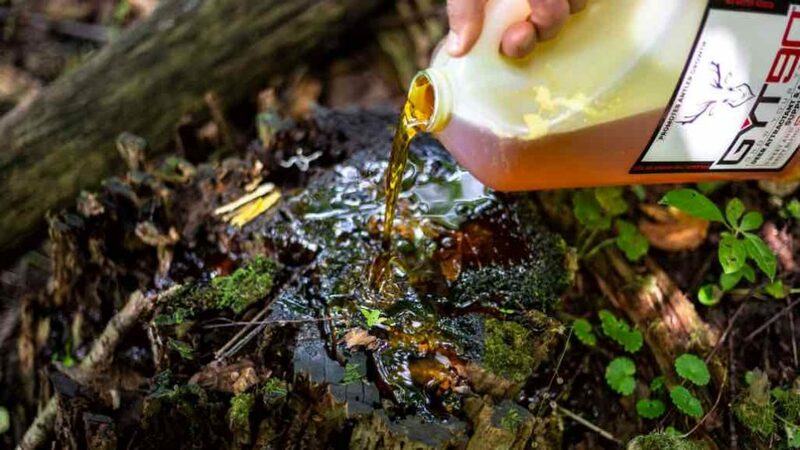 This one gallon blend of molasses and minerals is designed to be poured over a rotting stump. Since the stump is rotting, it is moist—which will help to release the sweet aroma that deer simply can’t resist. Some hunters mix this with a bit of corn to up the ante. The mixture will last for over a month. For best results, pour over a stump that is somewhat upright, and not already flattened. Many hunters agree that this should be high on the list of best deer bait. 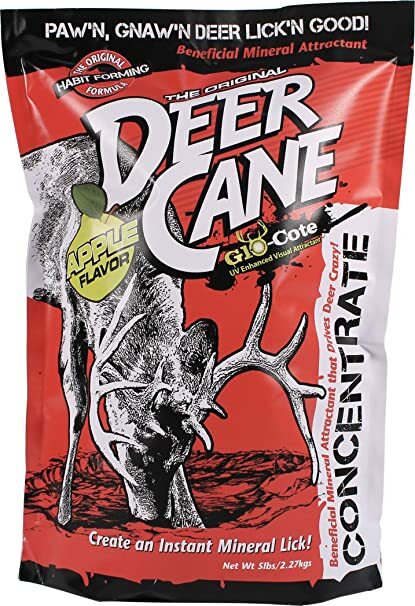 Another bait designed to create a buck mineral-rich vapor trail that deer can’t resist. Mix this bag with at least 6 to 8 gallons of water, and apply to a fairly bare area. If the area is not bare, the deer will not be able to lick, paw, or mark the area. When applied correctly, you can create a hotspot deer flock to all season long. Since 6+ gallons of water is quite cumbersome, this might not be the best bait for hunting grounds. In fact, you may not be allowed in with such a heavy equipment load. However, this is perfect if you will be hunting on your private property. If you are looking for the best attractant for year-round use, Lucky Buck is the way to go. This 20-lb. bucket provides deer with essential vitamins and minerals, that help them to grow healthy and strong. Poor over stumps, logs, or even directly to the ground—to create a year-round feeding area. Use for hunting, photography, up-close viewing, or simply to feed your local deer. This won’t work fast enough for same-day hunting, but look above for some more immediate baits. 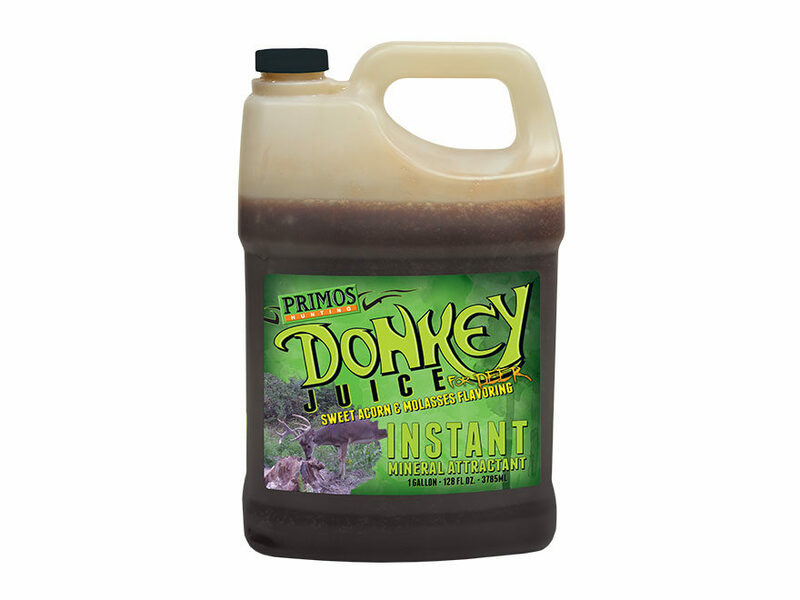 Don’t worry, donkey juice isn’t what it sounds like. 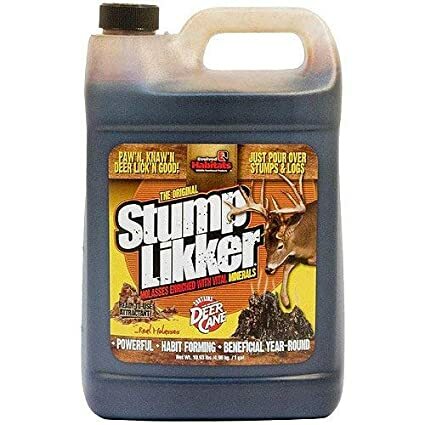 This nutrient-rich molasses-based attractant can easily be poured over stumps, feed blocks, or directly on the ground. Made from sweet acorn and molasses, there’s no need to worry about harming the natural surroundings. The thick consistency helps to attract deer faster than thinner baits—that you have to wait until they seep into the surroundings to be effective. This comes in a bulky one gallon jug, so you may need to portion into a smaller container for long treks into the wilderness. As an added bonus, this bait doesn’t smell as unappealing as some of its counterparts. In fact, this one smells good! As you can see, you have a versatile range of baits and attractants to choose from. The best deer bait attracts whitetails quickly, and can create a short or long-term hotspot and feeding zone. Make sure you read up on how to use your deer attractant, too. As a hunter, you may use a variety of products to attract game—as someone who simply wants a closer look, you may find a go-to product. Just make sure that whatever product you choose, that it is both deer and nature safe—which every product on our list is.